A slab leak can be a serious issue if not detected on time. This is a leak which occurs underneath a home with a concrete slab foundation. In order to prevent severe damage and mitigate the cost of slab leak repair, you should look for the best slab leak detection San Diego has to offer. Of course, before calling the professionals, there are some tell-tale signs which can alert you of a slab leak. If the hot water line is what is damaged underneath your home, there is a direct consequence which you can easily detect. One or several hotspots can occur on your home floor, especially if you don’t have carpets covering it. The hot water heats the concrete, which in turn heats your floors. If you feel a higher than usual temperature while walking around the house, this can be a sign. Another way to detect them is to see your pets suddenly lying in a specific spot of the house when it’s cold outside. If there is a slab leak, water will almost certainly create puddles in specific places close to your plumbing. This can happen in your bathroom, kitchen, and even outside of the house. In case of inside water pooling, you first need to check if that water is coming from some other, smaller leaks from nearby appliances. But in case you find a pool of water next to your outside wall, it most likely means you have a slab leak. Whatever the level of a slab leak, it will cause a surge in your water bills. So, if you receive a water bill which is significantly larger than usual, and there is no other explanation, a slab leak could be your problem. This can also be true if your heating bill is higher. Leaking water means that it is running 24/7, and that the heater could be working overtime to heat all the water inside the house. Water leaks will decrease the pressure in your water appliances, which can be noticed when you are using only one and the pressure is unusually low. The water leaving the pipes is the water which is supposed to travel to your showerheads and faucets, therefore the pressure will drop. 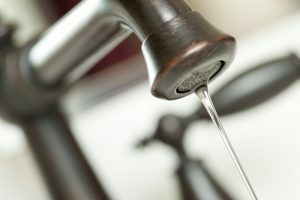 The water pressure will get lower, regardless of the severity of the water leak, because the water flows from the outside via your main water line. After some time, a water leak will affect your foundation, which can be manifested in cracking floors and walls of a house. This is already a serious sign and you need to call professionals at once if you detect your floors are beginning to crack. Sometimes, puddles and hot floors aren’t that obvious to the naked eye. However, accumulated water can leave other visible effects. If you have carpets, they will become damp and dark spots might suddenly appear on them. If you have hardwood floors, any deformation and warping might be an indication of a leak. Water damage can create mold or mildew, which might not be instantly apparent. But since any wood surface, such as hardwood or plywood, is a breeding ground, it will have an unpleasant odor. So, if you smell a sudden moldy, mildew odor, it’s time to look into a leak. In case of a water leak, depending on its intensity, the sound of flowing water can be heard throughout the house. If you know all your water appliances are turned off, and you can still hear the sound of running water, this is another sign of a slab leak. If you are suspecting a possible slab leak, you should contact professionals immediately. KIC Restoration will determine if there is a leak and how severe it is and get rid of your problem fast and effective. We provide the best slab leak detection in San Diego and our customers can be sure we will invest maximum effort in every job, no matter how big or small.